The Pietro Lorenzetti early 14-th century fresco in the Lower Basilica. In this image, the Christ Child asks His Mother, “Mamma, whom shall I bless?” In Christian tradition, St. John the Apostle (“the Beloved”) is on Christ’s right, but not here in Assisi: he’s on Christ’s left. 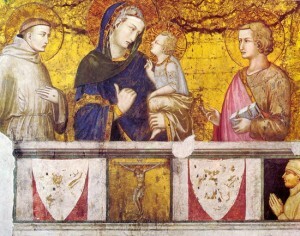 After all, the Virgin has answered her Son, “Pick him”, indicating Francesco. Look at his mouth, with lips curving downwards as if he were saying “Chi, io? !” (“Who, me?”) He is the preferred in his church, appropriately. Look at John with furrowed eyebrows as if puzzled, wondering why he is not on Christ’s right, preferred position. Look at his hands: that gesture is “Pazienza” (“patience”, literally – though the sense is “you win some, you lose some..why get an ulcer over what you can’t change..?”). After all, the greatest thing ever written about the Italians?